I thought for the next three Mondays I would share some stylestone bracelets that I created a little while ago. 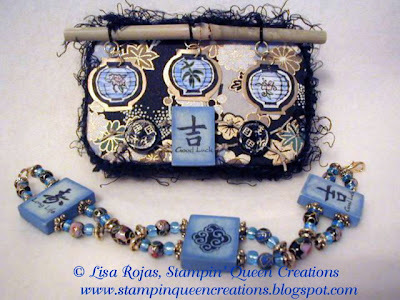 The stylestone that I used to create the bracelet are no longer available through Clearsnap, but you can buy a similar product that works just as well through Stampbord www.stampbord.com. I just love the different looks that I received when I designed these bracelets and the boxes that I made to go with them. All of the boxes where made with those nifty little Altoid boxes. Those boxes are perfect to use for small jewelry. Be sure you come back here on the next two Mondays for my follow up bracelets and boxes. You're not going to want to miss any of these and with the holidays right around the corner, these bracelets and boxes would make wonderful gifts for all of those lovely ladies in your life! Step 1. Spray entire tin box with 18KT Gold Plate Finish spray paint. Let dry. Lay box upside down on pattern paper and trace box lid with pencil. Repeat for inside lid. Lay box bottom side down for inside bottom lid. Cut out papers. Glue papers to inside and outside of tin. Step 2. Stamp Japanese lanterns on white card stock using Black Staz OnÔ inkpad. Color with pencils and cut out. Spray images with Preserve It! Lay images on black and then gold card stock, cutting each image slightly larger then the last. Adhere papers together. Punch each lantern with 1/8” hole punch at the top. Attach two jump rings to each lantern. Step 3. Adhere black fiber trim to outside of top lid. Attach black embroidery floss to top jump ring and tie to bamboo stick. Repeat with other two lanterns. Adhere bamboo stick and lanterns to lid top. Sponge Ice Blue inkpad to style stone. Stamp “Good Luck” on style stone with black solvent inkpad. Step 4. Cut tan embroidery floss in two strips of 5”. Tie a knot at the end of each piece of floss. Add beads and style stones to floss tying a knot between each one. When last bead is attached, tie a knot at the end of the floss. Adhere beads and floss to box lid with glue. 1. Using a sponge, lightly cover three style stones with blue ink. Add a darker layer of ink around the edges. Stamp images on stones with black ink. 2. Cut two pieces of jewelry wire 15” long. Thread a crimping bead to each wire and one end of clasp to the end of the wire. Pass wire back through crimping bead, leaving a slight tail. Use pliers to crimp together. 3. Separate wires. Thread gold spacer, light blue bead, floral bead, light blue bead, gold spacer, style stone, gold spacer, light blue bead, floral bead, light blue bead, gold spacer. Pull wires together. Thread large floral bead. Repeat two more times ending with gold spacer. 4. Thread a crimping bead to each wire and one end of clasp to the end of the wire. Pass wire back through crimping bead, leaving a slight tail. Use pliers to crimp together. Excess wire should be tucked into next spacer bead. I love your project and my color blue! Going to look for the web site, never seen any beads and the papers like this so different. Thats why you are the Queen ! I love your project ! Never seen beads and paper like this before. Thank you Terry! You know I'm not a jewelry maker but I'm really proud of these! Thanks Linda! You should try to make these. It's not as hard as it looks!